Typhoon Death Toll Rises In Philippines, Though Devastation Less Than Feared : The Two-Way Hagupit, now a tropical storm, forced more than a million people into shelters when it hit. At least 21 people are dead. But it spared the Philippines the devastation of last year's Typhoon Haiyan. A Filipino man carries a dirty plastic sheet from his house after strong waves from Typhoon Hagupit battered a coastal village in Legazpi, Albay province, in the eastern Philippines, on Monday. Residents began trickling back to their homes after the local government said the typhoon has passed their province. At least 21 people are dead and more than a million others have been forced into shelters after Typhoon Hagupit hit the central Philippines this weekend, but the storm has spared the region the devastation of last year's Typhoon Haiyan. Hagupit, which is called Ruby in the Philippines, has now weakened into a tropical storm. It made landfall shortly before nightfall in San Juan, a resort town in Batangas province, about 60 miles south of the national capital, Manila. It had maximum sustained winds of 53 mph and gusts of 60 mph. The Philippines Daily Inquirer reported: "Although it has weakened to 85 kph, Ruby still dumped rains in Batangas and nearby provinces while heading toward west northwest. Although considerably weaker from its peak power, the storm remains potentially dangerous and could still whip storm surges that could overwhelm coastal villages, weather forecasters said." 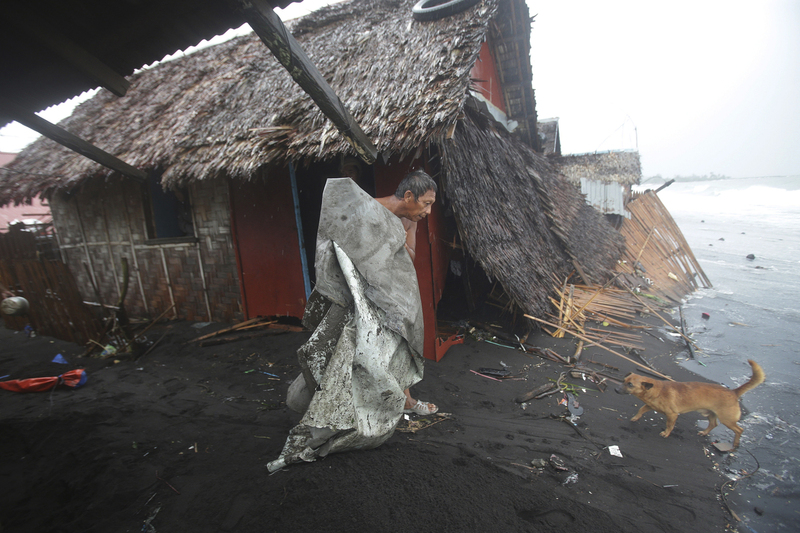 Hagupit has left at least 21 people dead so far, according to the Philippine Red Cross. Sixteen of those killed drowned in Eastern Samar Province, where Hagupit first made landfall on Saturday. The Daily Inquirer noted that the government has reported five other casualties. "It's really scary if you've watched what happened during Haiyan," Amy de Guzman, a 34-year-old mother of three who sought refuge in the gymnasium in San Juan, told The Associated Press. "I hope the storm blows away from here as far as possible." Many of those who had taken refuge in shelters began to return today to their homes after Hagupit had passed. The storm is expected to blow away Tuesday into the South China Sea. Haiyan, which was known as Yolanda in the Philippines, struck the region in November 2013, killing more than 5,000 people.